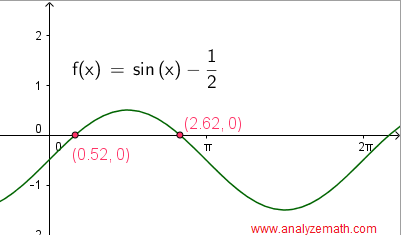 Ways of solving trigonometric equations with detailed solutions are presented along with graphical interpretation. 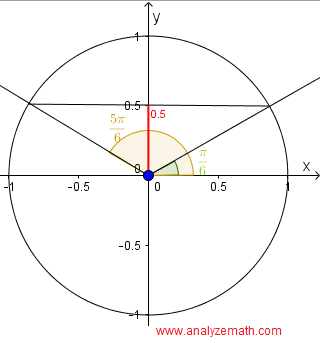 sin(x) = 1 / 2 in the interval [0 , 2π) and explain the solutions graphically using a unit circle and the graph of sin (x) - 1/2 in a rectangular coordinate system of axes. sin(x) is positive in quadrant I and II and therefore the given equation has two solutions. The graphical solutions of the equation sin(x) = 1 / 2 are obtained by first writing the equation with right side equal to zero sin(x) - 1 / 2 = 0. Then graph the left side of the equation and the solutions of the equation are the x - intercepts of the graph of f(x) = sin(x) - 1 / 2 as shown below. 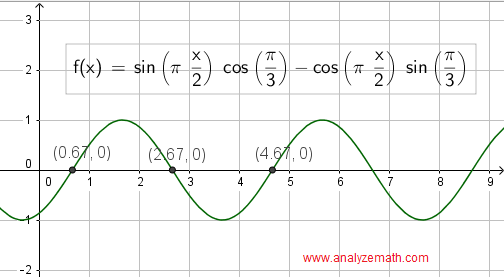 It is easy to check that the two x intercepts in the graph below are close to the the analytical solutions found above:π / 6 and 5π/6. 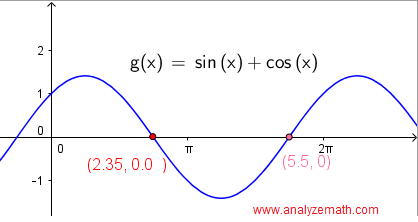 sin(x) + cos(x) = 0 in the interval [0 , 2π) and explain the solutions graphically using the unit circle and the graph of sin (x) + cos(x) in a rectangular coordinate system. The equation may be written as: sin(x) = -cos(x). The graphical solutions may be approximated by the x intercepts of the graph of g(x) = sin(x) + cos(x). We can easily check that the two solutions found above 3π/4 and 7π/4 are close to the x intercepts of the graph shown below. and check graphically the first few positive solutions. The first 3 positive solutions are: 2/3 , 8/3 and 14/3 corresponding to k =0, 1 and 2. 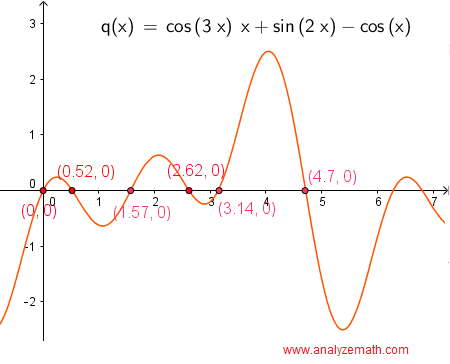 These values are close to the x intercepts of the graph of f(x) = sin(πx / 2)cos(π/3) - cos(πx / 2)sin(π/3) shown above. Find all solutions of the equations: 2 sin2(x) + cos (x) = 1. The first 3 positive solutions are obtained by setting k = 0 in all three groups of solutions to obtain: 0, 2π/3 and 4π/3. 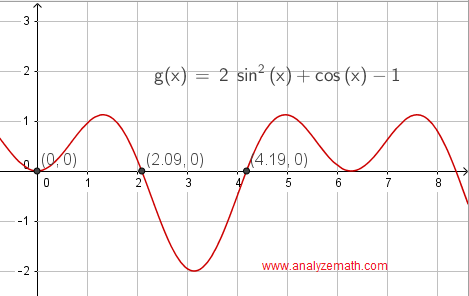 These values are close to the x intercepts of the graph of g(x) = 2 sin2(x) + cos (x) - 1 shown above. Find all solutions of the equation: 6 cos2(x / 2) - cos (x) = 4. The first 4 positive solutions are obtained by setting k = 0 in all four groups of solutions to obtain: π/3 , 5π/3, 7π/3 and 11π/3. 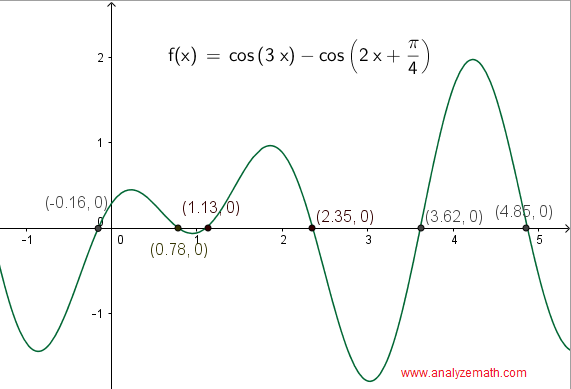 These values are close to the x intercepts of the graph of f(x) = 6 cos2(x / 2) - cos (x) - 4 shown above. 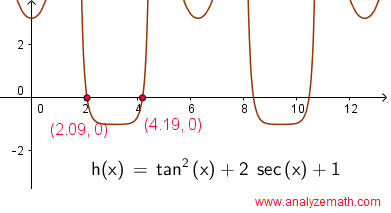 Solve the equation: tan2 ( x) + 2 sec (x) + 1 = 0.
sec (x) = 0 has no solution. The first 2 positive solutions are obtained by setting k = 0 in the two groups of solutions to obtain: 2π/3 and 4π/3. These values are close to the x intercepts of the graph of f(x) = tan2 ( x) + 2 sec (x) + 1 shown above. Solve the equation: cos(3x) + sin(2x) = cos(x). Set each factor equal to zero and solve. 1 - 2 sin(x) = 0 or sin(x) = 1/2 gives 2 other gropus of solutions. The first 6 positive solutions are obtained by setting k = 0 and k = 1 in the first two groups of solutions x1 and x2 to obtain: 0 , π, π/2, 3π/2, and k = 0 in the second and third groups of solutions x3 and x4 to obtain π/6 and 5π/6. 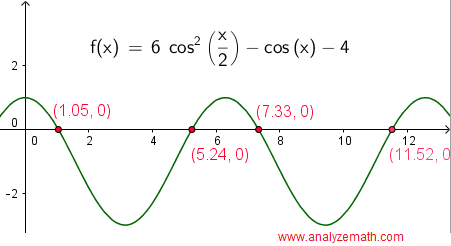 These 6 solutions are close to the x intercepts of the graph of f(x) = cos(3x) + sin(2x) - cos(x) shown above. 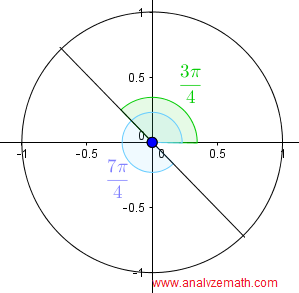 Solve the equation: cos(3x) = cos(2x + π/4). The 6 x intercepts shown in the graph of f(x) = cos(3x) - cos(2x + π/4) below correspond the solutions k = 0 in the first group x1 and k = 0, 1, 2 ,3 and 4 in the second group of solutions x2 = - π/20 + 2kπ / 5.